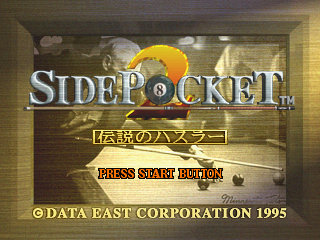 Side Pocket 2 (サイドポケット2) is a billiards game developed and published by Data East as a sequel to Side Pocket. It was released for the Sega Mega Drive and Sega Saturn in 1995. When brought to North America, the game was renamed Minnesota Fats: Pool Legend. It was followed by Side Pocket 3, also released for the Saturn, but only in Japan. While the Mega Drive and Sega Saturn versions of Side Pocket 2 share similar gameplay, the Saturn version has an entirely different story mode, complete with full motion video cutscenes. The two versions also have different soundtracks. Main article: Side Pocket 2/Magazine articles.